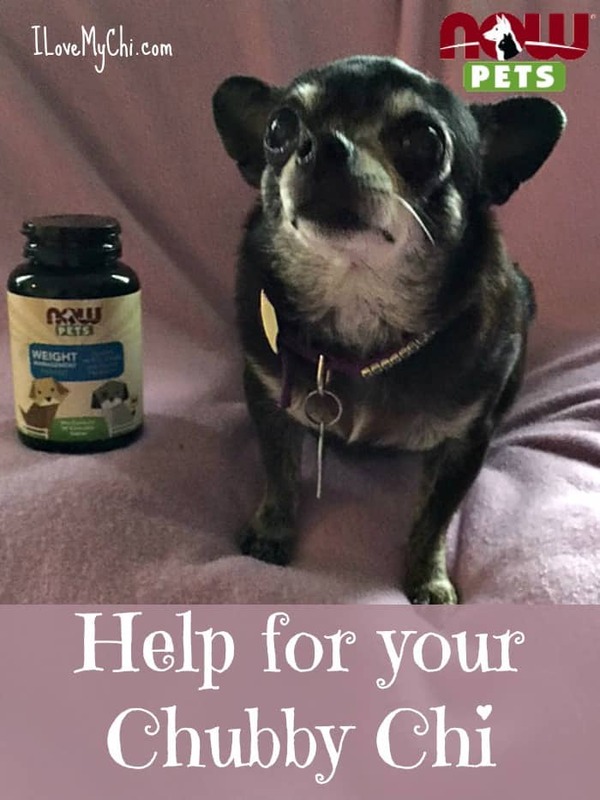 This post is sponsored by NOW® Pets and the BlogPaws® Pet Influencer NetworkTM. I am being compensated to help create awareness about NOW Pet Supplements but we only share information we feel is relevant to our readers. NOW® is not responsible for the content of this article. 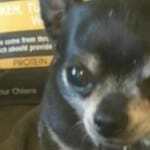 Do you have an overweight Chihuahua? I know I do. 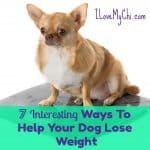 There are lots of reasons a Chihuahua gets fat such as not enough exercise, overfeeding, and medical issues such as thyroid problems. You should be able to feel your dog’s ribs but not see them. If you can see them, they are too thin. If you can’t easily feel them, they are too fat. Figure out how many calories your dog needs. My veterinarian taught me to do it this way:Divide your dog’s weight by 2.2 and multiply that number by 30. Add 70 to that number and that’s how many calories a day your dog needs. 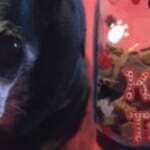 For example, Kilo’s weight is 8 pounds so eight divided by 2.2 is 3.63. 3.63×30=109. 109+70 is 179. So she needs 179 calories a day. This calculation is for an inactive dog. If your dog is active, or a puppy, they will need more. Feed good quality, high protein, low carb dog food. Take them for a walk every day. 30 minutes is ideal, but ieven a 15 minute walk will help. Play with your dog. There are lots of fun things you can do with your dog that will not only give you both some exercise, but help you to bond too. Play fetch, hide and go seek, and just chase each other around. Limit treats and make the ones you do give, high protein and tiny. A good quality dietary supplement may help too. In our case, we have a a double whammy for Kilo’s weight problem. Kilo has a large hernia that makes it uncomfortable for her to walk, so she’s not getting as much exercise as she used to. As for diet, well she eats the appropriate amount and we give her a grain free good quality food. BUT she steals treats from my 2 bigger dogs every chance she gets. And other family members give her the same size treats when ever they are giving the big dogs their treats (she does have her own tiny treats in her own little treat jar). So she has put on weight. A few months ago, she was weighed at the vet and was whopping 9.2 pounds. She should weigh 6 pounds. Since I can’t seem to control what others are giving her and since she just isn’t up to much exercise, I’m always looking for other answers. 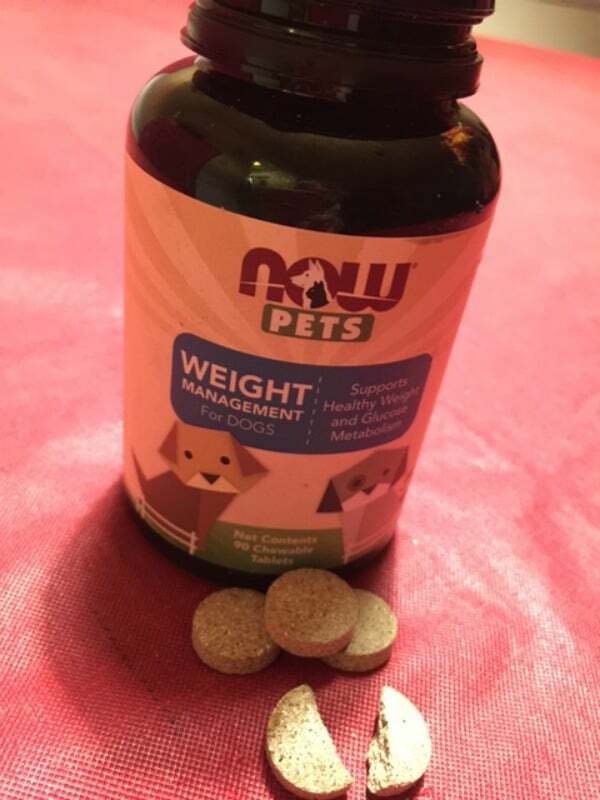 When I got the opportunity to try the new weight management supplements from NOW® Pets, I was all for giving it a go. I figured even if she doesn’t lose weight, she is still getting some healthy stuff with these supplements. I know the Now Pets company makes quality products. Immune Support-Keep them healthy and resistant to pathogens. Pet Relaxant- Great for a dog who is under stress or is high strung. Joint Support- Helps with flexibility and joint health. G.I. Support– Keep the digestion flowing smoothly. Omega 3 Support-Gives them the fatty acids to support brain, joint and a healthy immune system. I liked that small dogs only needs half a tablet, so this bottle will last twice as long. Also they were easy to split in two. I was able to do it with my fingers. 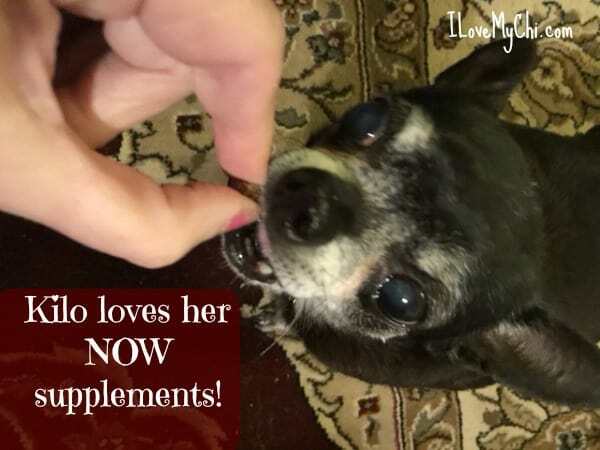 Kilo likes the supplements, she thinks they are treats. I can’t say the supplements caused this but when Kilo was checked at the vet in early March, her weight was 9.2 pounds. She was checked again last week and she is now at an even 8 pounds. Kilo has been taking these supplements for about a month now and I’ll keep her on them. In fact I plan on starting one of my big dogs Roxy on the Joint Support formula as she is having issues with going up and down stairs and jumping on the bed. Now here’s another cool thing about NOW Pets. They are hosting a giveaway where 4 winners will receive more than $350 of NOW products! And even cooler, they will donate $1 to the Best Friends Animal Society for each entry! I love companies that support animal charities. For every entry, NOW will donate $1 to Best Friends Animal Society, up to $5,000. Four entrants will win more than $350 in NOW® Products. You can connect with NOW products through through their social media channels: Facebook, Twitter, Instagram, Pinterest or check out their website. Let me know if you try any of these supplements. I’d love to know what your experience has been. 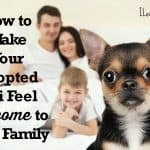 This article was very helpful as my chi Bentley weighed in at 16.75 lbs. He had recently become lethargic, slept all the time & didn’t want to go anywhere. I brought him to our vet & he was diagnosed with hypothyroidism, put on a prescription dog food along with daily medication. After being on meds for 4 days he was starting to act like his old self again….playing & liking to go for his nightly walks. I am definitely going to try these supplements. They can only improve his health & wellbeing. Thank you, Cathy! You are welcome Jean. I really wasn’t expecting much after just having Kilo on the supplements for a month so I was surprised she lost a pound. It may or may not be because of the supplements but either way, I figure it’s giving her healthy things she needs. Let me know how Bentley does on them. I can relate with Bentley as I too have hypothyroidism.